and modern American design pioneer and legendary graphic designer, Alvin Lustig. Monroe swam in the unique hourglass shaped pool and posed for photos along the legendary pool deck. In the 70s the hotel lost its allure and became a retirement home and apartment complex. It grew dull and neglected. During the late 90s, Brad Korzen purchased the property and named it Avalon Beverly Hills. His wife, Kelly Wearstler, with KWID Designs restored magic back into property. Strolling inside the lobby and into Oliverio restaurant, I felt as if I was transported into one of the super cool Palm Springs hotels. The property is visually stunning with its turquoise, gold, and white colors. Acclaimed chef Mirko Paderno creates an exciting Italian menu. This Italian chef first worked in America with Piero Selvaggio at Primi and Valentino. After a few years, he worked at Celestino Drago, Dolce and All’ Angelo before working side-by-side with Chef Andrea Cavaliere to open Cecconi’s. Later, Paderno was given the opportunity to open Oliverio at the Avalon. Our eyes widened with delight as we skimmed over Paderno’s menu. There were so many appetizers that we wanted to try in the Piccoli Piatti section. Our adorable server, Young, recommended we try one of Paderno’s Chef’s bites. It’s a three tiered serving dish filled with tasty Italian delectables. We ordered the Rustico with the top tier showcasing buffalo meat sliders with grilled onions and robiola cheese on small sesame seed buns. The cheese is made from equal portions of cow’s, goat’s and sheep milk and offers a slightly tangy taste. They were delicious. Even though the chicken skewers were grilled with onions and lightly brushed with a mild herb sauce, they lacked flavor. 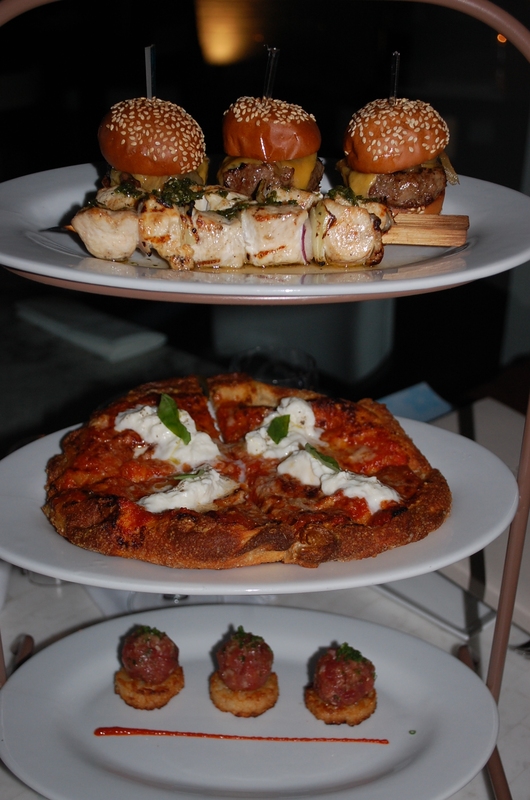 The second level displayed a Napoletana pizza topped with burrata cheese. The potato flour crust creates a crunchy, yet chewy pizza. Topped with a light covering of fresh tomato sauce, basil and a soft mozzarella cheese with cream, it offered a soft almost butter-like texture. Sensational! The bottom tier had three little tonno piccante or spicy tuna tartar bites served on rice cakes that tasted a lot like potato pancakes. 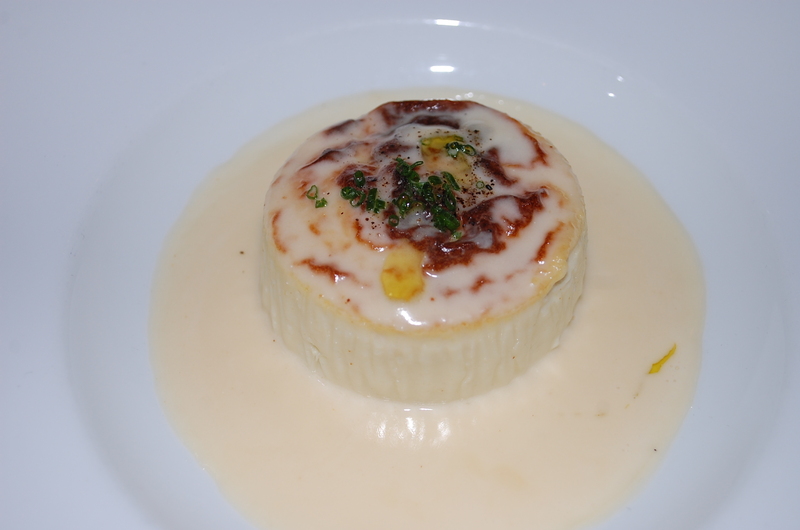 Next arrived an ambrosial cauliflower soufflé with the consistency of flan. The creamy cauliflower is mixed with eggs and an Italian triple cream and rich mascapone cheese. It rests on top of a warm pool of Parmesan, cream and shallot sauce. I could’ve lapped this creamy goodness up until my belly was full, but I had to save room for two more entrees. 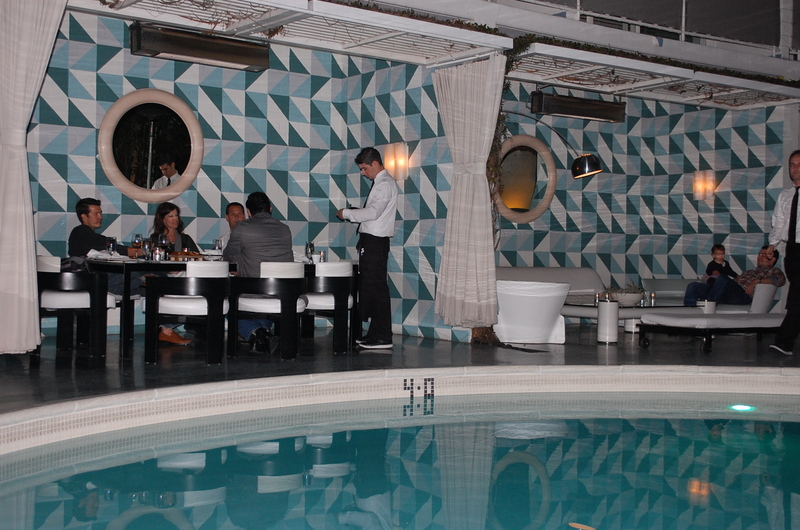 While sitting along the window overlooking the aquamarine lit pool I noticed a few brave souls dining in the private poolside cabanas with geometric wall graphics and large round mirrors. The new restaurant manager, Bill Haig explained, that even though it was in the low 50s outside, the outdoor heaters keep the guests toasty. During the summer, these cabanas are reserved weeks in advance. It’s an ideal fresco dining spot. Sipping white Italian wines that smelled of honey suckle and tasted slightly like stone fruit, we looked back out onto the pool and tranquil designed pool deck. As if on vacation, our worries of the past weekday melted away. Another sip of wine and we enjoyed a fork full of Paderno’s signature spaghetti Norcina. Wow, what a standout dish. Young (with the best dimples in Los Angeles) shared with us that Paderno marinates his black winter truffles in olive oil, garlic and anchovies. His homemade pasta is cut square shaped with a guitar string device. 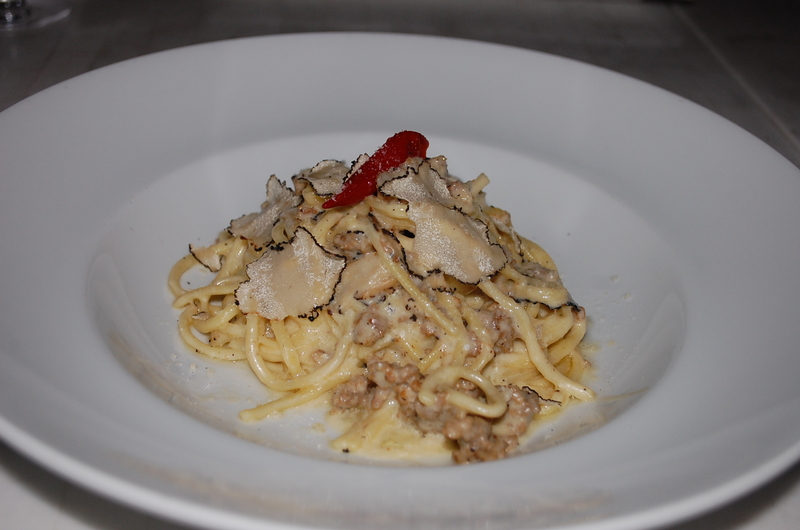 It’s mixed with a little cream, garlic, shaved truffles and Italian pork sausage. This stunning dish is topped with a fiery red and spicy Calabria pepper. Known as one of the world’s best tasting hot peppers, its scary hot at the first bite. Since I am a wimp with hot peppers, I tasted it and put it aside, while concentrating on the milder flavors of the black truffles and sausage. 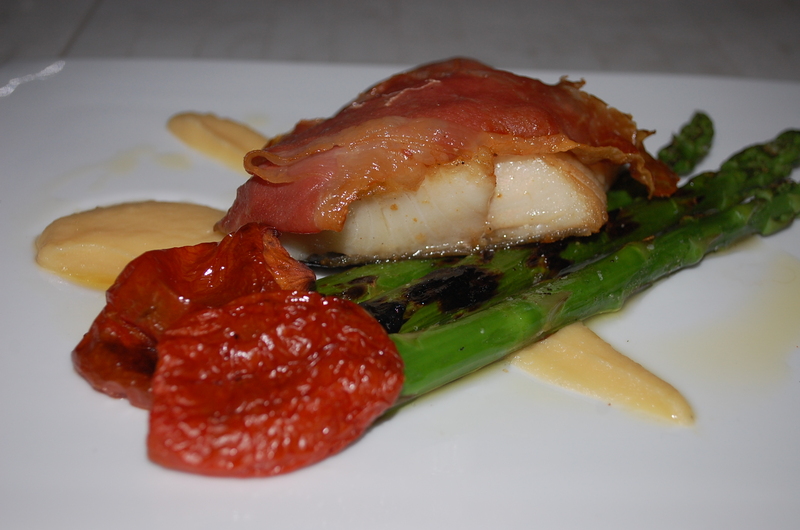 The colorful Merluzzo dish arrived with prosciutto melted on top of a lovely piece of black cod. This cooking technique infuses the flavor of the ham onto the fish creating a most moist and savory piece of cod. Resting on a chickpea puree, next to perfectly cooked asparagus and oven roasted tomatoes. It was exquisite. Paderno’s oven roasted tomatoes would make a tomato-hater, become a tomato believer. For dessert we shared the budino di polenta. It’s a delicate and light tasting lemon polenta pudding cake with layers of apricot jam, resting on passion fruit sauce with a lemon cream on top. We also tasted the tortino di Ciccolate with banana sauce. Imagine an Italian flourless chocolate cake with banana gelato (they ran out of banana and substituted it with French vanilla gelato). This is an epicurean delight for chocolate lovers. As we were getting ready to leave, Young told us that many of the dishes on the menu are recipes from Paderno’s mother. She mentioned that there is a rooftop garden at the hotel. It’s an ideal spot for Paderno to pick herbs, tomatoes and vegetables for his daily specials. I’ll be back when the weather warms. Expect to see me reclining in one of the hip cabanas drinking a cool summer cocktail and nibbling on Paderno’s signature spaghetti and cauliflower soufflé. $$-$$$. Open daily 7a.m.-11a.m., 11:30 a.m. -2:30 p.m., 6 p.m. –10 p.m. 9400 W. Olympic Blvd., (310)277-5221.
via Oliverio at the Avalon published in the Beverly Press 4/15/11.